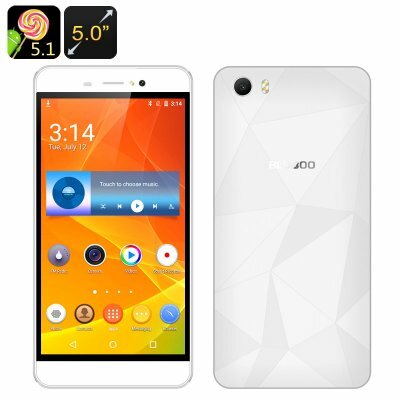 Successfully Added BLUBOO Picasso Smartphone - 5 Inch 1920x720 Screen, Android 5.1, Dual SIM, 3G, Gesture Sensing, LED Flashlight (White) to your Shopping Cart. The BLUBOO Picasso Android comes with a nice 5 inch screen, 3G network support on two SIM cards, Gesture Sensing, a powerful LED flashlight and , let’s admit it, a pretty cool name. Enjoy all the benefits of Android 5.1 interface on a nice 5 inch screen with 1920x720 resolution. Enjoy watching movies, browsing the web, going over your pics and videos and more. Thanks to Gesture Sensing, you will have a nice fun feature for quicker navigation. Simply draw a letter on the phone’s locked screen and get to some of your favorite apps instantly, without unlocking the phone. The phone comes with loads of storage space. You will have 16GB internally and the option to expand that with 64GB more on an SD card. So, feel free to load up on apps and games at the Play Store and take lots of photos with the phone’s two cameras. The BLUBOO Picasso comes with the MTK6580 64bit Quad Core CPU and Mali-T720 GPU for seamless multitasking and fast gameplay. The built-in LED flashlight is a great feature to have handy for black outs or when coming home late. And the 2500mAh battery allows for 4 hours of continuous talk time. With Bluetooth 4.0, the phone efficiently communicates with other devices and you can hook up wireless headphones, speakers, smart watches and more. With Wi-Fi tethering support, you can also make the Android phone a hotspot for other phones to connect.